This is a close up photo of one way to build the form work for a woodchip clay wall system. 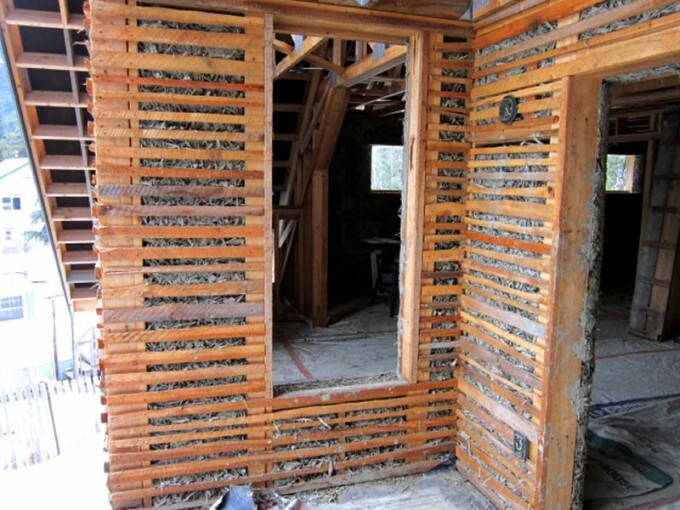 The thin strips of wood (called lath) will keep the woodchip clay mixture in the wall as well as provide a strong foundation for the coat of earthen plaster to adhere to as it is applied to the wall. Woodchip clay walls systems involve mixing a clay slurry (either clay soil or just clay with water) with woodchips or long wood shavings. Then the mixture is packed loosely into forms, leaving small air pockets as thermal breaks. The wood fibre provides the tensile strength of the mixture and some of the insulating property, and the clay provides thermal mass and moisture content mitigation.